William Bear’s penchant for getting whacked out on sniff and wandering around downtown Winnipeg scaring people because of the large knife he carries in his pants likely saved his life. The irony of existence sometimes amazes me. So does its cruel sadness. Such was the case of the 34-year-old chronic substance abuser, who, (setting aside his criminal record) has racked up 53 documented Intoxicated Persons Detention Act arrests in his relatively short adult life. He was picked up on Fort Street after a frightened member of the public called 911 to report a weirdo was walking around downtown in broad daylight with the weapon. Police rush into the area, and find Bear, staggering around. In the plastic shopping bag he was carrying was a king can of beer. Given his long and dated history with Winnipeg’s finest (and the fact he was out on ‘supervised’ probation), Bear’s locked up and spends the next 33 days behind bars. A few days after he’s nabbed, the Austin Street rooming house he once called home is firebombed — allegedly by a woman looking to get payback on a relative but missed the target, killing five people Bear likely knew. Bear’s arrest “might have saved his life,” Judge Fred Sandhu heard today. In any event, Bear’s released soon after the fatal fire and picked up again just recently causing a disturbance outside the Main Street Project. Cops note he’s got a black rag soaked in paint thinner on him. In the plastic shopping bag he was carrying was a can of beer. By Friday, Bear, who hails from Berens River, is likely going to be back in the city. But — despite his truly awful personal circumstances — he could be considered one of the lucky ones. He’s obtained help from a program to get him into housing and is on the waiting list for the Bell Hotel on Main Street. For his part, Bear swears he’s headed straight from jail to a detox program, but said he wasn’t interested in staying at the Sally Ann in the interim due to some issues with drinking and drugs on its doorstep. He was carrying the knife in his pants because of the brutal assaults many shelter-less people experience in the city, he said. Sandhu expressed worry that Bear — with his history of getting out of his mind on sniff — could end up harming or even killing someone without really realizing what he was doing. However, given the nature of the charges he pleaded guilty to, there’s little Sandhu could do to keep Bear locked up. “If you’re walking down the middle of the street and there’s nobody there, might be a couple of panhandlers … or somebody that you think [is] selling drugs, how do you feel? Normally, you’d think, ‘this is not very safe,’” Winnipeg police Chief Keith McCaskill told the Winnipeg Sun’s editorial board on Wednesday. Perception of safety downtown is just as important as the reality, McCaskill said. If people perceive they’re unsafe, then it’s really the same effect is if they’re actually unsafe. The goal is to get more people — including cops — into the area on a permanent basis. McCaskill said he believes having the police headquarters right in the heart of downtown will help as more cop cars will be around, and more officers will be in the skywalks and on the ground as they go about their days. For example, crime — especially vehicle break-ins — drops noticeably when a Jets game is on, he said yesterday. The equation: more people, more activity equals fewer problems. Better perception. Better perception of safety. The police service is already involved a crime prevention through environmental design study in the area, and has pledged more cops and bike patrols for 2012. But it must be said: as efforts to continue to try and get more people into the beleaguered area, we as a society have to do more to help people in circumstances like Bear’s get right — if they want the help. Barring that, we need to implement a system to keep the chronically drunk, high or vagrant out of the downtown proper — no matter the time of day. Loitering in front of MEC? Off you go. 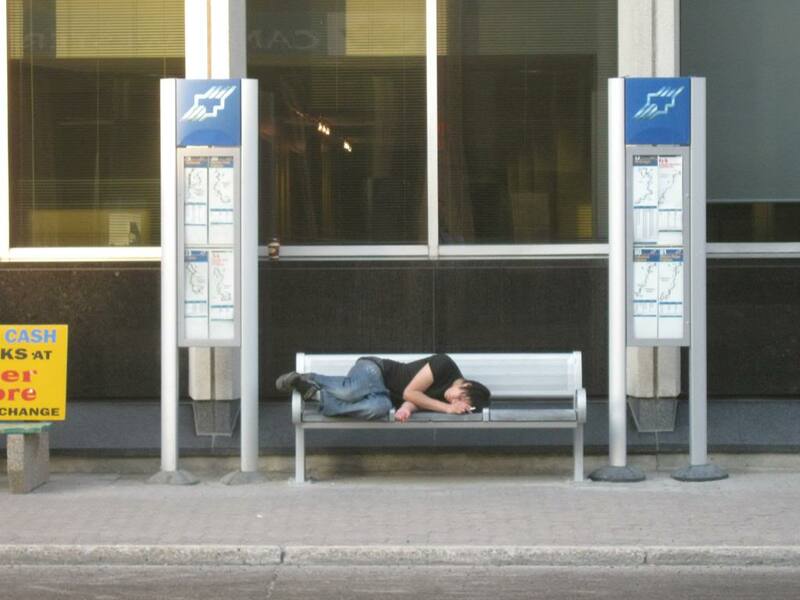 Camped out in front of Portage Place or Giant Tiger? Sayonara. It’s the only way downtown will ever have a chance to truly change its image and make it a truly genuine option as a place to live in Winnipeg. So you are suggesting that upon conviction – multiple convictions? – for disorderly conduct within the downtown geographic area, the perp be redlined from the area? In prostitution and some other cases (see link), the Crown can set a requirement to stay out of certain areas. You show up, go back to jail. What’s the difference? Again James, thanks for some of the more interesting work on the crime file. Shine the light!